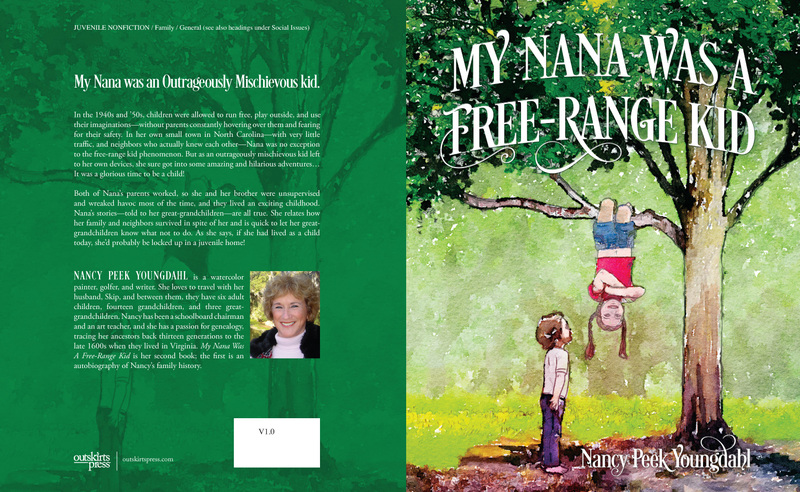 Author Nancy Peek-Youngdahl is taking her latest book My Nana Was A Free-Range Kid, on tour — a Virtual Book Tour with Outskirts Press. What this means is that Nancy will get her book into the far corners of the globe, all from the comfort of home! Keep an eye out for Nancy’s book as she will be featured on several blogs over the weeks and months ahead so keep your eyes peeled to learn more about her and her book. Luckily for us, Nancy was kind enough to answer a few questions as the tour was getting started so that we can give you a sneak peek into the mind of the creator of My Nana Was A Free Range Kid. OP: Tell us a little bit about My Nana Was A Free Range Kid. What is it about? Nancy: Nana’s outrageous childhood adventures as told by her great-granddaughter, Adalee. Nancy: I wanted to keep stories alive throughout family generations. Nancy: All ages who enjoy humorous tales and especially children who love adventures, creative illustrations, and life-learning experiences. Nancy: This is a valuable children’s book which encourages respect of elders even if those old days were “weird.” It shows Adalee’s love for her great-grandmother and her contagious joy for the stories she shares with the reader. That joy brings such honor to our older generation. This book ties many lessons of what “not to do” and will surely hold imagination long beyond the last page. Nancy: This book contains real life adventures that also tell children what not to do to stay safe. Nancy: Yes, I published an Autobiography entitled A Peek Into My Life. Nancy: Yes. I have written three other children’s books about a Chickadee Bird named “Joe.” I have also created several watercolor illustrations for these books which I hope to have published. I would also like to write a fictional book about true life adventures which were journaled by an ancestor who lived in the late 1800’s. OP: Thanks for your time, Nancy! We look forward to learning more about you as you visit other bloggers! Nancy Peek Youngdahl is an artist, crafter of jewelry, a soap maker, writer, and avid golfer. She loves to travel with her husband, Skip, and between them, they have six adult children, fourteen grandchildren, and three great-grandchildren. Nancy has been a schoolboard chairman and an art teacher, and she has a passion for genealogy, tracing her ancestors back thirteen generations to the late 1600s when they lived in Virginia. My Nana Was A Free-Range Kid is her second book; the first is an autobiography of Nancy’s family history. Nancy Peek Youngdahl is self-publishing a book with Outskirts Press, and she wants your help deciding her upcoming book cover. My Nana was an Outrageously Mischievous kid. In the 1940s and ’50s, children were allowed to run free, play outside, and use their imaginations—without parents constantly hovering over them and fearing for their safety. 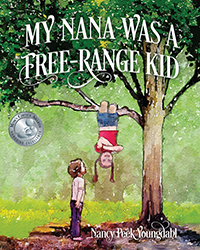 In her own small town in North Carolina—with very little traffic, and neighbors who actually knew each other—Nana was no exception to the free-range kid phenomenon. But as an outrageously mischievous kid left to her own devices, she sure got into some amazing and hilarious adventures… It was a glorious time to be a child! Both of Nana’s parents worked, so she and her brother were unsupervised and wreaked havoc most of the time, and they lived an exciting childhood. Nana’s stories—told to her great-grandchildren—are all true. She relates how her family and neighbors survived in spite of her and is quick to let her great-grandchildren know what not to do. As she says, if she had lived as a child today, she’d probably be locked up in a juvenile home! 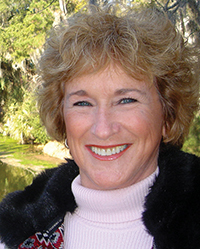 Nancy Peek Youngdahl is a watercolor painter, golfer, and writer. She loves to travel with her husband, Skip, and between them, they have six adult children, fourteen grandchildren, and three great-grandchildren. Nancy has been a schoolboard chairman and an art teacher, and she has a passion for genealogy, tracing her ancestors back thirteen generations to the late 1600s when they lived in Virginia. 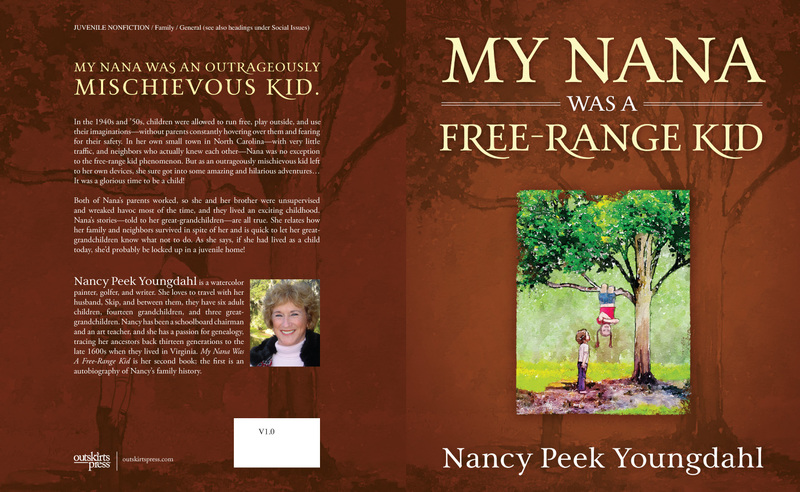 My Nana Was A Free-Range Kid is her second book; the first is an autobiography of Nancy’s family history.